If you are anything like me, you will smoke out the whole kitchen in the cooking process of this recipe. Fear not, though — the reward is great. All steaks are best when prepped and seasoned simply, cooked quickly and given plenty of time to rest. Do those three things and no amount of smoke will dampen the result. 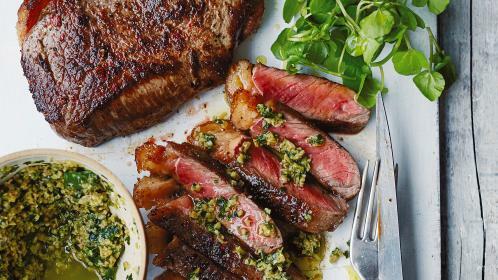 Serve these tasty strips of steak and the indulgent dips with some flatbread and a tangle of watercress. 01 Set a griddle pan over a high heat, ready to cook the steaks. 02 Lay out a large sheet of greaseproof paper and drizzle a little oil over half the paper. Sprinkle over some cracked pepper. Place the steaks on top in a single layer, then drizzle again with oil and sprinkle over some more pepper. Fold the greaseproof paper over to cover the steaks, like a book cover. Using a rolling pin or butcher’s mallet, bash the meat all over. You don’t want to squash the meat flat, but make sure it has all been whacked firmly. This will improve the tenderness of the cooked meat. 03 Place one of the steaks on your now-smoking-hot griddle pan and cook for 1½-2 minutes on each side, depending on the thickness of the steak. I would recommend medium-rare in this instance. Once cooked, set aside on a plate to rest and repeat with the remaining steaks, cooking them one at a time. Allow the cooked steaks to rest for at least 20 minutes, although the longer, the better. 04 To make the tapenade, place the ingredients in a food processor and blitz until you have a chunky paste. Season to taste. 05 For the mayo, mince the garlic in a pestle and mortar until you have a smooth paste, then add the oil and season with smoked salt and freshly ground pepper. Stir your garlic oil into the mayonnaise until well mixed. 06 Slice the steaks into fine strips and serve with your two dips and the sprigs of watercress.